Cephaloblog » We Have a Winner!!! Congratulations to Jeanna for winning the Lunapads Contest Giveaway! Jeanna, please check your inbox for an email from me asking for your shipping info and fabric choice for your Sampler Pack! Everyone else who entered, please check your inbox for a small consolation prize from Lunapads! Let me tell you, you ladies did not make picking a winner easy! Just know that I had to narrow it down several times, and then ask for help judging the final three comments! The top three answers were all so close, I honestly wish I could have given them all a Sampler Pack. I thank you all so, so much for your amazing responses to my questions. The number of comments I received for this contest overwhelmed me, and reading each and every one of your answers was a personal reward for me. If nothing else, this post will be a great resource for women considering making the switch from disposable to reusable menstrual products! They will find 67 incredible reasons why from smart, passionate, amazing women. Jeanna’s response won because she brought to light something I had never thought of before – the fact that despite the media latching on to the eco-friendly trend and encouraging going green with a multitude of different suggested lifestyle changes, using alternative menstrual products is seldom (if ever) mentioned. Which explains why a middle aged mother of three like Jeanna could have gone so long without ever hearing of a Divacup or a Lunapad. She also succeeded in giving me and several other judges a good laugh, which, coupled with the thought of her passing her newfound reusables knowledge (and maybe some of her Sampler Pack) onto her daughter, helped us to make our decision. Jeanna’s winning comment* is below. 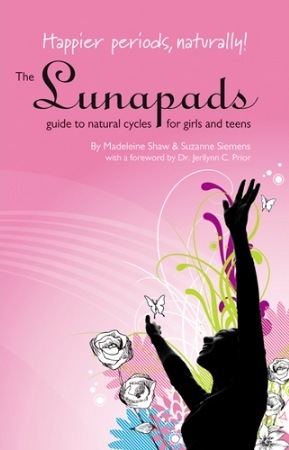 I encourage you all to read it, as well as to read all of the wonderful comments on the Lunapads Contest Giveaway post, as they are refreshing, inspirational, and just plain old good advice from women, for women. “Why didn’t somebody tell me this before??!!! I don’t mean to complain, but honestly, I am a middle aged well educated mother of 3… Would it really have been so difficult? I went green. I recycle. I bring all my bags to the grocery store with me. I buy yogurt in the quart tub. I walk when I can. I turn off the light when I leave the room. Would it really have been so hard for someone to say, ‘Hey, there are alternatives. Have you heard of… Have you tried this?’ I have watched Matt, Al, Meredith and Ann recycle, reduce and reuse for a year now. They have redone my house, my car, my pets and my childrens lunchbox. I have watched Diane, Robin, Sam and Chris correct my paper bills to electronic, stop junk mail, and recycle my old computer parts. 4 comments to We Have a Winner!!! It was Monday. The first day of summer vacation. I packed all 3 of my kids in the car and started on errands and grocery shopping. Arrived at Trader Joe’s to discover I had left my purse at home. Retrieved purse. Two visits to the potty later I bought 3 bottles of wine and a box of pad thai. Drove next door to Target. Visited potty (I did say 3 kids….). Bought lunch….visited potty before we could eat. The flying monkey wasn’t feeling good – he didn’t eat. He slept in the cart while I did my shopping; when I checked him he had a fever….bought essential groceries and headed home. While trying to maneuver everyone and everything inside while simultaneously getting my 8 year old packed for a sleepover and chat with neighbor girl I dropped 2 bottles of wine and 2 dozen eggs in the driveway (inside my reusable shopping bags. Gross.). Good thing there were three bottles. Finally, everyone is settled…. check the mail…… yippee! My Lunapads arrived!! It was truly the only bright spot in my long, long day. They are sooo pretty (one was fossil fern, the other kaleidoscope). What beautiful fabric, superb workmanship, and an excellent design! I can’t wait to try them and decide what else I need to go with them…. When I first was looking at the website I thought they were pretty expensive. But I have to tell you ladies that are researching this that they are comparably priced with other sites. And you will not find any that are made any better than these. They are exquisite! And when you remember that this is a one-time expense, instead of a monthly purchase, it is a bargain!! Thank you again, Ariel and Lunapad Ladies!! Jeanna, I am so thrilled that receiving your Lunapads brightened your day! And I’m so glad you’re happy with them. Thanks for letting me and the ladies at Lunapads know that you like them – I am so grateful I was given the opportunity to give them to a wonderful woman like you! And thanks to Ariel for having such a great blog and inspiring us all to be thinkers…and squid-lovers!